One of my favourite aw11 collections, The Illusions d’Ombres de Chanel present the enchanted world of precious materials brought to life at your finger tips. Inspired by the sparkling facets of cut stones and vintage make-up, Illusion d’Ombres de Chanel is a beautiful and exceptional collection, with iridescence, intensity of colour and reflections. The collection encompasses glimmers of gold, bronze and platinum, glowing in a palette of enigmatic luminous colours with a vintage luster. The more delicate shades of pink, coral and white recall the freshness of flowing tulle. The Illusion d’Ombre eyeshadow interprets the richness of the precious metals and delivers a sensory experience from first contact. The long-lasting silky cream texture has a powdery appearance, thanks to the translucent silicone-based formula, which accentuates the pure pigments and pearly particles, pearls always inseparable from Mademoiselle Chanel’s story. The eyeshadow is available in a series of stunning colours, custom applied to create not only the desired intensity but also an adjustable makeup result. Fantasme is an iridescent white, Mirifique every nuance of black, Émerveillé, a tender peach, Ébloui a brown smouldering with red, Illusoire: a grey-tinged taupe and Épatanta a grey-shadowed khaki. The applicator brush included has tapered bristles to allow for precise make up at the corner of the eye and can be used for eyeliner with the darker shades. Further eyeshadows can be found in Les 4 Ombres. Prélude offers a base of essential, chic and classic tones. The four understated shadows in timeless colours – grey brown, grey beige, luminous beige and deep taupe brown, provide a matte or satiny makeup result. The impulsive lipstick, Rouge Coco, by Chanel provides a rich femininity to the smile with two beautiful shades. Plumetis, an innocent peach tone and the luminous Etole, a coppery rosewood that matches the lip pencil. One of my favourite items is the Joues Contraste, feminine and fresh blush. Against a pure, translucent complexion, Rose Écrin spruces up cheekbones with a tender healthy glowing effect. Last but by no means least are the incredible Le Vernis nail polishes. Similar to the eyeshadows, Le Vernis is inspired by the effects of materials and adorn nails in the most fabulous of metallic and shimmering reflections. Péridot is a gold and green which intertwine and immerse themselves in the glow of a moiré effect. Graphite is the fusing of a silver, gold and platinum while Quartz is a bronze which becomes smitten with pink for a sophisticated result. 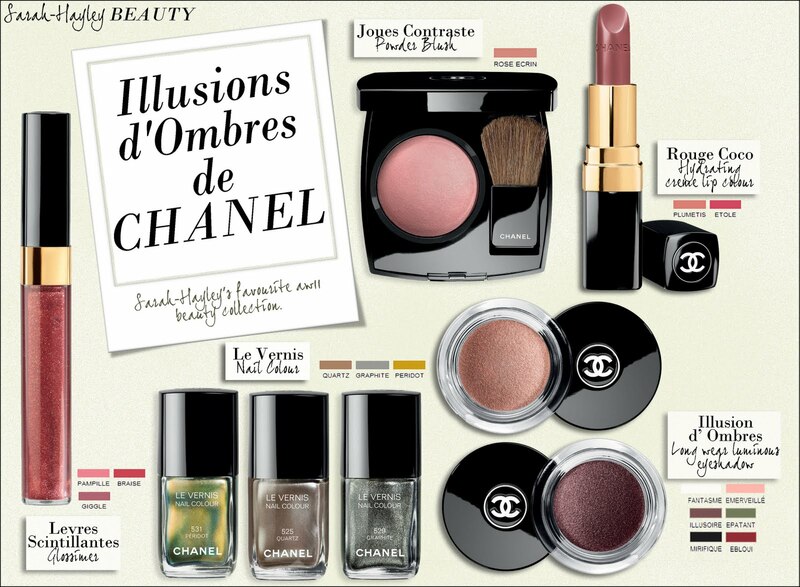 Illusion d’Ombres de Chanel is available at Chanel counters nationwide and Selfridges online.